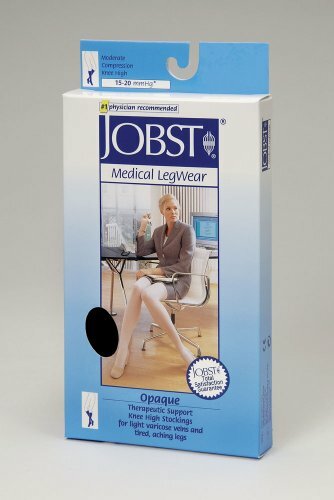 JOBST Relief stockings for men or women are made from smooth breathable fabric and available with a closed or open toe. Relief is Jobst's economy brand and features a generous toe area and reinforced heel pocket. 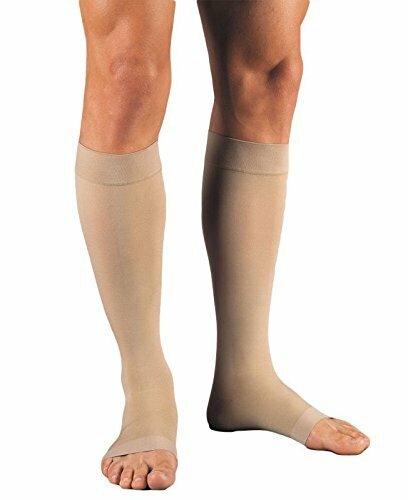 This compression stocking provides 30-40 mmHg of gradient compression and helps improve blood flow prevent edema (swelling) and reduce the discomfort caused by moderate to severe varicosities. 115605 Size: Medium Petite, Color: Natural Pictured in Natural Features: -Sock.-Material: 81pct Nylon, 19pct spandex - latex free.-Fabric: Opaque.-Toe type: Closed toe.-Luxuriously smooth and easy to wear.-Lightweight and highly effective in optimizing leg health.-Special processing and a silicone blend softener make these stockings one of the easiest to put on.-Resilient yarns allow for greater durability.-Reciprocated heel and toe for better fit and durability.-Smooth design and soft texture provides softer more fashionable look with the ultimate in year-round coverage.-Condition: Mild swelling, spider veins, tired, aching legs, varicose veins-mild.-Sold as a pair. Options: -Available in classic black, espresso, honey and natural colors.-Available in small, small petite, medium, medium petite, large, large petite, x-large and x-large petite sizes. Dimensions: -Style / Length: Knee high. 115271 Size: Medium, Color: Natural Pictured in Natural Features: -Sock.-Material: 78pct Nylon, 22pct spandex - latex free.-Fabric: Opaque.-Toe type: Closed toe.-Luxuriously smooth and easy to wear.-Lightweight and highly effective in optimizing leg health.-Special processing and a silicone blend softener make these stockings one of the easiest to put on.-Resilient yarns allow for greater durability.-Reciprocated heel and toe for better fit and durability.-Smooth design and soft texture provides softer more fashionable look with the ultimate in year-round coverage.-Condition: Chronic venous Insufficiency (CVI), moderate / severe swelling, varicose veins - moderate / severe.-Sold as a pair. Options: -Available in classic black, espresso, honey and natural colors.-Available in small, small petite, medium, medium petite, large, large petite, large full calf, x-large, x-large petite and x-large full calf sizes. Dimensions: -Style / Length: Knee high. Quality and therapy at a moderate price.JOBST® Relief® delivers compression therapy at an affordable price. This is especially important when reimbursement, provided by managed care, limits product choices.Features and Benefits:Leg TherapyAccurate gradient compression therapy provides relief from tired, aching legs and varicose veins.Comfortable•3-D knit structure uses air-covered spandex yarn that is soft to touch and comfortable for all-day wear.•Closed toe styles are designed with a roomy toe for patients who require additional "wiggle room".Compression15-20mmHg*Colors: Beige, BlackStyleKnee, Thigh, Waist, Chaps. Lightweight. Resilient yarns allow for greater durability. Reciprocated heel and toe for better fit and durability. Available in knee high, thigh high and pantyhose styles. Assorted colors. High quality medical products used by healthcare providers in the top clinical settings. Quality and therapy at a moderate price.JOBST Reliefdelivers compression therapy at an affordable price. This is especially important when reimbursement, provided by managed care, limits product choices.Features and Benefits:Leg TherapyAccurate gradient compression therapy provides relief from tired, aching legs and varicose veins.Comfortable3-D knit structure uses air-covered spandex yarn that is soft to touch and comfortable for all-day wear.Closed toe styles are designed with a roomy toe for patients who require additional "wiggle room".Compression15-20mmHg*Colors: Beige, BlackStyleKnee, Thigh, Waist, Chaps. JOBST Relief stockings for men or women are made from smooth breathable fabric and available with a closed or open toe. Relief is Jobst's economy brand and features a generous toe area and reinforced heel pocket. This compression stocking provides 20-30mmHg of gradient compression and helps improve blood flow prevent edema (swelling) and reduce the discomfort caused by moderate to severe varicosities. 115333 Size: Large, Color: Natural Pictured in Natural Features: -Stocking.-Material: 82pct Nylon, 18pct spandex, latex free.-Fabric: Opaque.-Toe type: Open toe.-Luxuriously smooth and easy to wear.-Lightweight and highly effective in optimizing leg health.-Special processing and a silicone blend softener make these stockings one of the easiest to put on.-Resilient yarns allow for greater durability.-Reciprocated heel for better fit and durability.-Smooth design and soft texture provides softer more fashionable look with the ultimate in year-round coverage.-Gender: Women's.-Condition: Mild swelling, spider veins, tired, aching legs, varicose veins-mild.-Sold as a pair. Options: -Available in classic black and natural colors.-Available in small, medium, large and x-large sizes. Dimensions: -Style / Length: Knee high. Looking for more Jobst Opaque Knee High Socks similar ideas? Try to explore these searches: Rock Climbing Outlet, High Efficiency Wood Burning Fireplace, and Jogger Alarm.